While the capital is home to an estimated 40 per cent of the UK’s Muslim population, there are still many mysteries surrounding the faith that I follow. For I was born and raised a London Muslim. I attended mosques and madrassas in Tooting and Balham, adding to the knowledge of Islam taught me by my family. From a young age we learned the importance of the five pillars of Islam; faith, prayer, charity, fasting – and Hajj, a pilgrimage to Mecca in Saudi Arabia, a journey every Muslim must try to make in their lifetime. So I was delighted to visit the British Museum’s Hajj: Journey to the Heart of Islam. Muslims have been performing this pilgrimage for centuries; non-Muslims are not allowed to enter this holy city. An estimated three million people from all over the globe do so every year: Chinese, Namibian, Azerbaijani and every other kind of Muslim, as well as the 25,000 British Muslims who travel each year to form this kaleidoscope of our planet. We perform rituals that symbolise the lives of the Prophet Abraham and his wife Hagar. By completing these acts we develop a greater spiritual awareness, and share a sense of solidarity with other Muslims from across the world. I first performed Hajj in 2007: I was told I was the first Western minister ever to make the pilgrimage. I am used to the different fragrances and languages of London’s streets and to jammed Tubes and buses in rush hour – but nothing can prepare you for the Hajj. The sheer crush of people, the food and outdoor restaurants, the heat and the babble of languages spoken by pilgrims all form a cocktail of smells and sounds that are still memorable and fresh to me today. I found the Hajj to be a great leveller of people: all male pilgrims wear the same two pieces of white cloth, share the same facilities, and live cheek by jowl for a number of days. You could be next to a pauper or a prince. In between prayers, groups from different parts of the world gather and swap stories. I fondly recall meeting up with an aunt and uncle from Pakistan there. The mobile phone is a godsend in catching up with friends and family but it is still amazing how many friends you simply bump into. But where the Hajj is strictly for followers of Islam, this exhibition is not. I toured it with a non-Muslim friend. He was as fascinated as I was to see how pilgrimages undertaken hundreds of years ago compare to those of today, where modernity and tradition meet, and the beauty of Islamic art, found in everything from milestones to water bottles. This exhibition gives us a new window not just on to Islam, but on to modern London too. Sadiq Khan is Labour MP for Tooting. 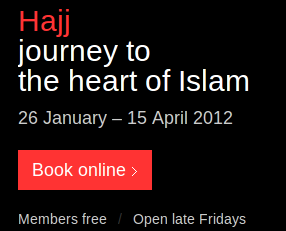 Hajj: Journey to the Heart of Islam opens today and runs until April 15 (britishmuseum.org).